I'm back, everyone! It was nice to take a break, especially since it was my first "busy season" at my new job. There were some long nights in there, but I pulled through! To celebrate the return, I thought what better than to have a sparkling wine. Plus, in case you haven't noticed, they're my favorite. While we were on the Whole30 (which if I'm being honest, I didn't finish), we did a bit of shopping at Trader Joe's. I've always been a little intimidated by their wine section because I just don't know where to start. I know there are some gems in there, but I'm more worried about the bad apples I may have to try (ex: their canned wine) to get to the gems. Anyway, the last time I was there, I decided to risk it and put this inexpensive bubbly into my basket. After looking at the bottle more, I had high hopes for this wine. It said "Methode Champenoise" on the label which means the wine goes through secondary fermentation in the bottle... same as Champagne. Plus, it is the same grapes as Champagne, so that combined with the "methode champenoise", I was hoping for that hidden gem I mentioned earlier! When I opened the bottle, I did not get any hint of breadiness (often described as yeasty, brioche, toast, etc.). This comes from the wine being on the lees, or dead yeast cells. It's my new favorite flavor and aroma in a sparkling wine, so I was a little disappointed. But for $9.99, my expectations were way too high, and I could move past it. The wine was definitely fresh and zingy. Lots of citrus and tart apple notes. It was almost a little too zingy... definitely no shortage of acid in there. I'd say at first, it made my eyes go wide, but then I got used to it and found it to be refreshing. I think it'd be great for mimosas or with fried foods because that acidity would be perfect to cleanse the palate. I think I'll try their rosé next time! Do you have any favorites at Trader Joes? Leave a comment, if so. I'd love to try them! 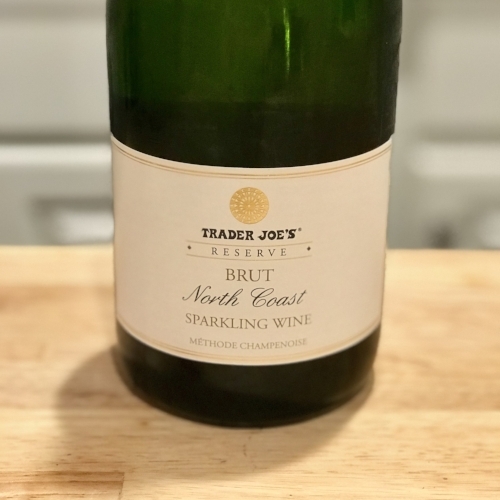 Sparkling wine has far and above become my favorite wine to drink, and while I wish I could afford delicious Champagne on a regular basis, it is always important to scope out value options. This is where Cava comes in! It is made in the same manner as Champagne, is still delicious in its own right, and comes with a lower price tag. Rondel may sounds familiar to you since I have used Rondel Brut in its identifiable blue bottle many times in the past, mainly for sparkling cocktails. It is inexpensive, flavorful, and comes in the handy split bottles. However, when I came across the Rondel Platinum, their elevated version, I thought I'd give a whirl to see if it could make the cut for New Year's Eve! This Cava is a deeper straw yellow color and has finer bubbles. While the bottle's description boasts citrus and tropical fruits, I definitely picked up on more of a tart apple aroma. There was also some toast or bready smell, which comes from the yeast that is used to ferment in bottle. The same flavors come across on the palate, with an addition of a zing of lemon. While this Cava is definitely acidic, it is more well-balanced than the Rondel Brut and is extremely easy to drink. As my mother stated, "It is very smooth!" There is nothing complex about this Cava and don't expect it to hold up against Champagne, but at the price point, it is a good choice for an everyday or even a NYE sipper. Merry Christmas everyone! While it's hard to believe Christmas is already here, this time of year is my absolute favorite. What's better than time spent with friends and family, sharing meals and listening to cheerful music?! Nothing, I tell you. I have been seeing lots of posts about various Christmas cocktails and felt like I should get on that train! My creative side was sparked when my cousin mentioned trying to make a cranberry sparkling drink, and I was even more inspired when my aunt sent me a huge box of delicious citrus from Florida. I knew I wanted to make more than one recipe, so I went with one sweet(er) and one savory version. Fair warning, these syrups need lots of time to cool fully so make sure you prepare them in advance! Also, I know it's a little late in the game, but these simple syrups, especially the cranberry version, would make a great hostess gift for any holiday party. Get a cute little bottle like this one (the 8.5 oz one is perfect! ), fill 'er up, and attach this recipe (or other recipe ideas!) as a tag. This sparkling cocktail is made from a simple syrup of, you guessed it, cranberries and orange zest! It produces a syrup that is a beautiful, vibrant, light red color that's perfect for Christmas. If you like sweeter drinks, this syrup is right up your alley. Add some cranberries and an orange slice for garnish! Combine the water, sugar, and cranberries in a saucepan. Bring to boil. Once boiling, stir mixture until sugar is dissolved. Once the sugar is dissolved, turn down heat to where it's a heavy simmer or low boil for 2-3 minutes. This is when I added the orange zest. You'll hear the cranberries pop, which is what we want! After the 2-3 minutes, remove the pan from heat and let it cool for another 10-15 minutes or so with the berries. Pour the syrup through a strainer into the bottle and let it cool fully in the fridge. Syrup should be good in your fridge for about a month. The beautiful thing about this sparkling cocktail is you can adjust the ingredients as you see fit! I suggest the mixture above, but if you want it a little less sweet or a little sweeter, you can pour the syrup accordingly. Enjoy! Now onto the savory syrup. Don't get me wrong, there is PLENTY of sugar in this one too, but the rosemary really gives it that savory flavor, which is perfect for this winter season. Combine the water, sugar, and rosemary sprig in a small saucepan. Bring to a boil. Once boiling, stir mixture until sugar is dissolved. Once the sugar is dissolved, remove the pan from heat and let the rosemary steep for 5 minutes. Remove the sprig and let the syrup cool until it can be poured into a bottle. Once in the bottle, let the syrup cool fully in the fridge. Mixture should be good in your fridge for about a month. To enjoy the cocktail, combine the ingredients for the spritz above and enjoy! It has been a BUSY last couple of weeks for Kevin and me. We celebrated Thanksgiving across the pond in London, and then last weekend, I got to visit my best friend in New York City! I've been on the go, and it doesn't look like the holiday time will slow down for me much, but that doesn't mean you can't enjoy some good wine, right? 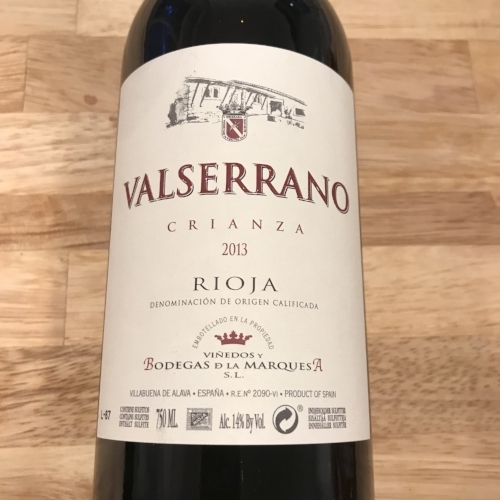 This week, I decided to get back to the 2017 Total Wine Top 20 list with this red from Rioja. For those not familiar with Spanish wines, particularly those from Rioja, the region's star grapes is Tempranillo and the region has a board that controls the quality of wine. This is similar to France and Italy. You can read Wine Folly's more detailed post here, but I'll summarize some key facts. There are four levels of Rioja, starting from base to top quality: Rioja, Crianza, Reserva, Gran Reserva. Each level has longer aging requirements in both barrel and bottle, and each level gets more expensive. So, for a wine in the Crianza level, the Rioja board requires 1 year of aging in barrel (usually used oak) and 1 year in bottle. Why does that matter? The flavors that come from oak won't be as strong on a Crianza, and the wine will be more affordable than those with longer oak aging. I'd say that sets up this wine pretty well. The bottle stated that it was cask aged over 16 months, and I bought the 2013 vintage, so it's been in the bottle for a couple of years. Overall, the wine smelled very nice -- like dark red fruit, pepper, and some smoke or earthiness. This all translated to the palate, too. 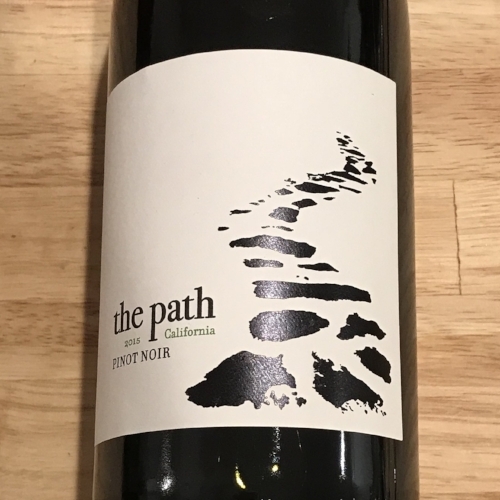 It's very fruit-forward with black cherry and maybe even some blackberry with a hint of spice. The wine was not very tannic, which surprised me for Tempranillo, but the acid makes it very food friendly. We paired it with this wild rice casserole by Budget Bytes, and I thought the flavors went well together. I think it could stand to "open up a bit" because the flavors developed over time. So, if you can remember to do this, open the bottle about an hour in advance, or even better, decant it! Great flavor, good price point, and overall, a nice wine to have with dinner.